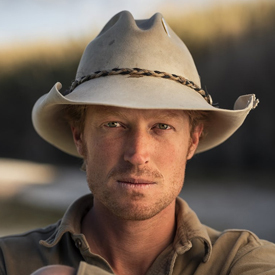 Ben Masters grew up in West Texas, studied wildlife biology at Texas A&M University, and spent four years working on a border ranch near Laredo. Masters is best known for Unbranded, a feature documentary on Netflix, in which he and three friends adopted 16 wild mustangs, trained them, and rode 3,000 miles from Mexico to Canada to inspire wild horse adoptions. He is a published author, a National Geographic photographer, cinematographer, and writer. His work has received dozens of domestic and international awards including the Audience Award at Hot Docs International Film Festival, the People’s Choice Award at Banff Film Festival, and the Audience Award at Telluride Mountainfilm.